Sorrento is a lovely Italian town on the coast of the Bay of Naples. It’s a particularly picturesque town as it’s located on top of a cliff with the waters below. One of the most famous and popular attractions of the town is Piazza Tasso, which is an entire square housing charming boutique cafes and restaurants for you to dine on. When you’re in Sorrento you should stay at a hotel which is best situated to offer you lovely views of the coast, looking out into the sea, yet is well connected to the Piazza Tasso. This article lists out the top luxury hotels in Sorrento so that you can make a more educated decision regarding your travels. When you’re in Sorrento, the primary thing you need is a stunning view of the ocean. Well, this luxury five star hotel sure delivers on that. It’s built over a high cliff, and has a broad terrace which offers a beautiful view of Mount Vesuvius across the bay. You can even avail of an elevator to go down to the harbour and be ferried over to the surrounding islands of Capri and Ischia. The hotel is extremely peaceful and calm, and features a well maintained garden of olives and lemon trees, and as such you also feel like you’re in the midst of nature. If you want to thread your way down the alleys full of cafes and restaurants, you can simply walk on over to main shopping and dining areas. The hotel makes use of a number of grand intricate flower vases and other such decorations, which can often come across as a bit antiquated in style, not very trendy. However, if that’s your aesthetic comfort zone, you won’t be disappointed. The hotel consists of three buildings, and there are 91 rooms available amidst them. You can choose the kind of room and view you prefer, you can get a room with the garden view, sea view, or get a suite with a sprawling private terrace looking over at the waterfront. Some of the suites even have their own indoor grand pianos. All the rooms feature marbled floors with frescoes painted on the ceilings. This luxury hotel is located in a far more quiet and solitary end of the cliff, and also features a stunning view of the Bay of Naples, and Mount Vesuvius. You can also walk down to the local fishing villages in Marina Grande. These offer some truly charming and picturesque sights, and to experience a little of the local life you can even dine out at the waterside fish restaurants in one of those villages. If you’d like to explore some of the city, you can find yourself in the market hub with the boutique shops and cafes within 5 minutes, by feet. The structure on which the hotel has been established was built way back in 1750 as a private Villa, but was transformed into a hotel in 1820. The hallways are entirely made of marbled floors, and the walls are pristine white, and house some stunning antique sculptures and paintings. If you’re one for art and culture, the hotel is bound to hold a fascination akin to that of a museum. 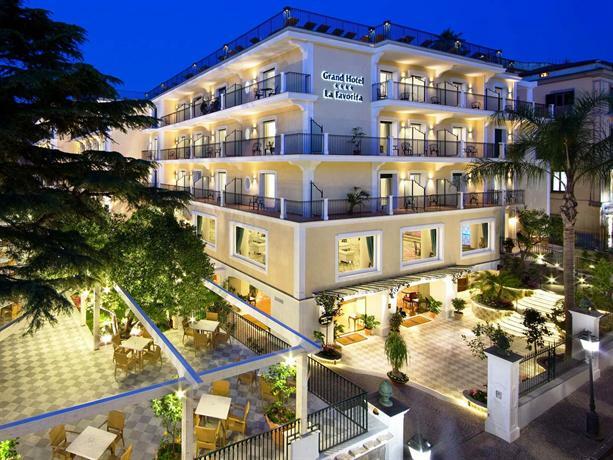 This lovely boutique hotel features 50 guest rooms, and all but two of them offer a stunning view of the sea. The rooms have been primarily designed in an Italian aesthetic with pristine whites and gilded mirrors, but they also bear a few distinctly contemporary markers such as the vibrant color palette of mauve, pink, and powder blues. This luxury hotel is also perched atop a cliffside, facing the sea, and with an added view of Capri beyond the horizon. This hotel has managed to garner quite a reputation for itself as the place where “time stands still.” The hotel features lovely lush green gardens that you can wander amidst in the mornings, feeling rejuvenated amidst the dew-encased blades of grass and leaves, or you can see the warm glow of the setting sun reflecting upon the sea and gleaming off against the trees in the evening. The hotel is so scenic that you may very well feel like spending your whole day by the pool, living off their poolside bar. Ages ago, the site of this hotel used to play host to an ancient Roman Villa, and the structure on which the hotel has been established used to be a Jesuit monastery in a previous incarnation. As such, the hotel is living amidst centuries of history and heritage. The hotel manages to maintain that sense of heritage without sacrificing on the comforts of contemporary luxury living. The on-site restaurant Scintilla is famous across Sorrento for its regional cuisines, featuring a levy of seafood pulled fresh from the surrounding seas. You can also avail of the spa services, swim off the seaside dock, or avail of the hotel’s day cruise trips to the surrounding island of Capri. Like all other hotels in this list, this luxury hotel also boasts a grand and expansive view of the deep blue sea perched atop the cliff face, and surrounded by lush green gardens. 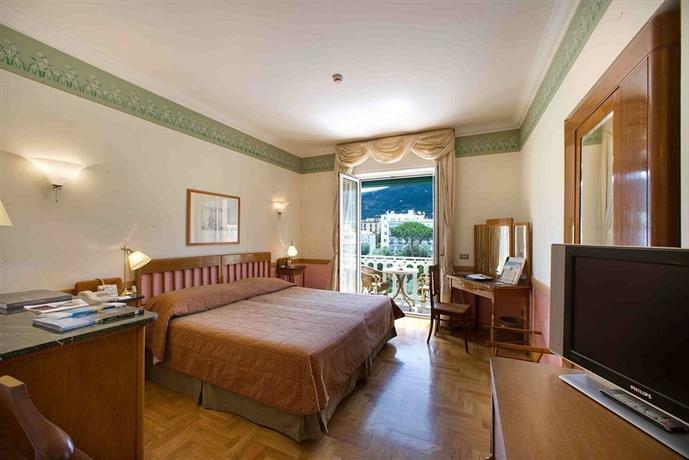 However, this hotel is a little more removed from the center of Sorrento, and is thus only ideal for those who are looking for a complete retreat into a luxury resort. You can walk to the center of the city in about 15 to 20 minutes, or avail of the shuttle bus service that periodically takes guests to the city. However, during peak traffic hours the shuttle service can be painfully slow. As far as the aesthetic sensibilities of the hotel are concerned, everything here is diligently minimalist and modernist. The building is designed in a pristine white cubic style, with white bedroom tiles, and sea blue bed fixtures and other details. This can help enhance the space and the brightness of the entire structure, however it can even come off as quite cold and forbidding to those who aren’t too keen on minimalist architecture. The hotel is definitely very trendy and chic, and the shades-of-blue color palette very naturally melts into the blue of the surrounding sea, thus making for a truly luxurious atmosphere. You can even avail of the boat service to be taken to the coast and the surrounding islands. This luxury hotel is famous for its amenities such as a lovely sprawling pool, and a courtyard where you can be served cocktails in the evenings. A small walk can bring you to Sorrento’s centre, and as such you can be well connected to the city, while still being somewhat removed from it at the same time. A short ten minute walk can bring you to the street most famous for all its boutique shops and charming roadside cafes. If you’d like to eat in the hotel itself, you can head on over to their restaurant, offering breakfast and dinner buffets. Alternatively, if you’d like to spend all your day by the pool and not move a muscle, you can simply order food from the poolside bar. A short 15 minute walk can also bring you to the shingle beach. One of the great things about this luxury hotel is its sheer attention to detail. For example, to make controlling the switches from the bed convenient, you have a panel to control everything right by your bed. The bathroom not only features a separate bath tub and a shower, but the shower itself comes with three different types of shower heads. 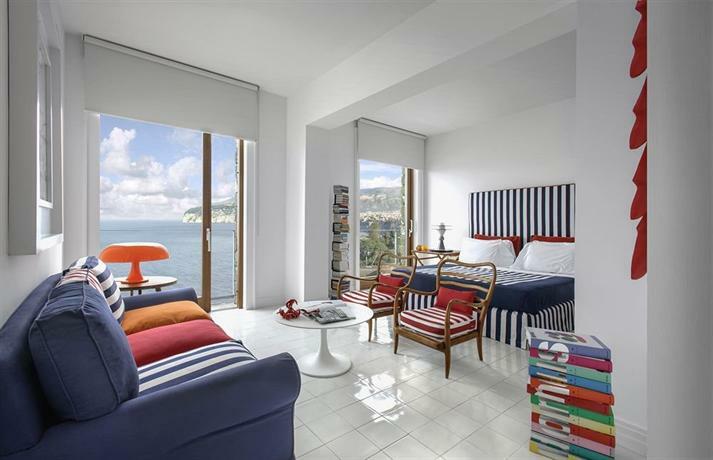 The balconies in all the rooms boast a view of the Bay of Naples and Mount Vesuvius. The hotel is located about 15 minutes from the town center, by foot. However, since it’s perched on a cliff the climb uphill can be a bit tiresome. 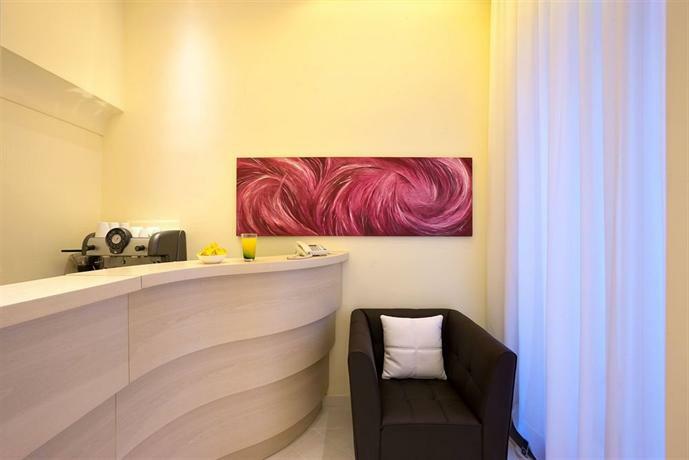 This trendy boutique hotel is just a 10 minute walk from the center of the city, and offers a grand panoramic view of the Bay of Naples and Mount Vesuvius. As such you can easily walk down to the town, and to their charming cafes and shopping outlets, and then retreat into your luxury rooms to watch the sun set. The aesthetic sensibilities of the hotel are halfway between modern and ‘old-world’ in nature, with a very Mediterranean color palette replete with pale yellow painted walls and stone bricked pavements. 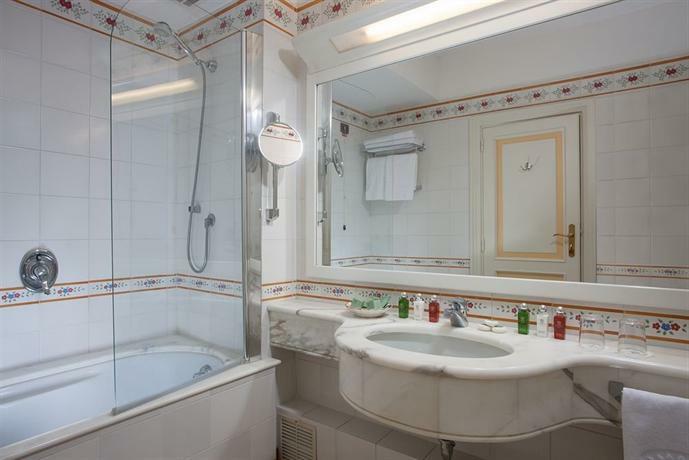 This luxury hotel is located in a very quiet part of the center of the city, however it’s just across from the prime location of Piazza Tasso. The hotel has been designed in a sleek and contemporary style, however what truly sets it apart is its endeavor to remain eco-friendly. To that end, the hotel features natural hemp insulation, and makes other endeavors to cut down on polluting consumption and wasteful energy consumption. In fact, even the wall partitions in all the rooms have been made with recycled wood-cement. If you’re someone who is naturally more environmentally conscious, then this is the place for you. This luxury hotel is perched on a very quiet street smack right in the center of the city. A five minute walk on foot would take you to the buzzing life of the city with all its charming cafes and boutique shopping outlets. The hotel also has access to a lift that can take you to the ferry terminal or the beaches. As far as the aesthetics are concerned, this hotel is resolutely contemporary, with a blue and white color palette and a lemon yellow facade, but the colder aspects of minimalist architecture is slightly tempered with the generous use of antiques and vases to make it a little more homely and welcoming to those who find modernist architecture overwhelming. 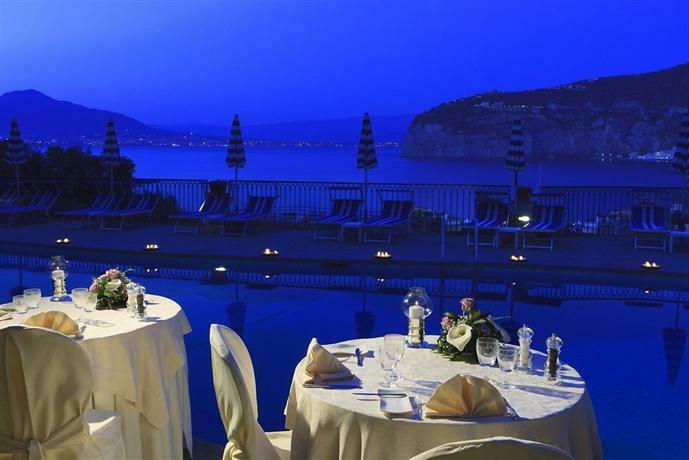 The hotel also comes with a large rooftop terrace, with a swimming pool, lounges, and even a bar and restaurant from which you get a stunning view of the Bay of Naples and Mount Vesuvius. The hotel’s private garden is beautifully designed with lemon trees aplenty, and a vast variety of other exotic plants as well. There are 85 rooms in the hotel, and they’re all designed in a similar aesthetic sense, with white and blues predominating. 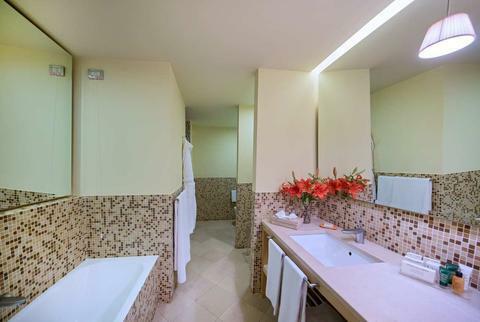 However, the bathrooms also feature a touch of yellow accents to make things more vibrant. The sea view is unfortunately only afforded to floors three and above, and even then the view is slightly hindered by Hotel Tramontano which falls on the way. This boutique hotel is located smack right in the middle of the city center, just a short walk from the bus stations from which you can easily commute all across the city. The hotel has been designed in such a manner so as to enhance natural lighting, and make all the walls and rooms feel vibrant and colorful. The bathrooms feature their own spa showers, along with chromotherapy functionality, and luxurious toiletries. There’s also a private beach that you can head over to, which is just 1 km away, and as a guest of the hotel you get a discounted entrance into it. This luxury hotel is also perched atop a cliff with a grand and unhindered view of the Bay of Naples and Mount Vesuvius. It’s a few minutes away from the city center, on foot. The interiors of the hotel features a vast and spacious reception area which can also double as a common area where you can interact with other guests, and the lounge area also features a grand piano that the guests are welcome to play. The hotel’s swimming pool is in the midst of a garden, and has a poolside bar and restaurant that you can eat at. 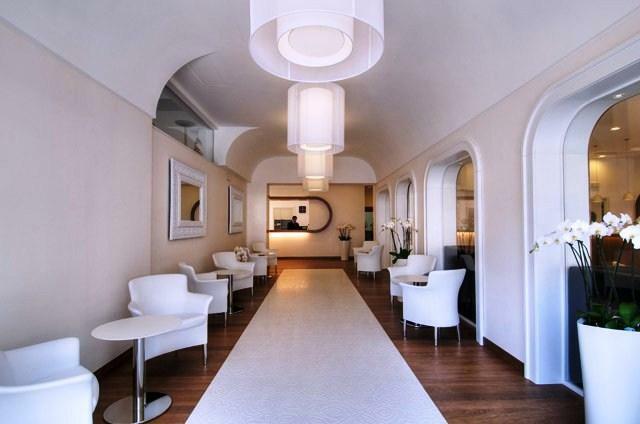 This luxury hotel is located just over one of Sorrento’s original filing ports — Marina Grande. It’s a bit more removed from the main tourist attraction spots, favoring quietude over connection, and it boasts a stunning view of Mount Vesuvius and the Bay of Naples. As far as dining is concerned, you can either walk over to the town, which will take a couple of minutes by foot, or you can simply go down to one of the beach cafes and restaurants in Marina Grande. All the rooms in the hotel feature their own private balconies with an armchair facing towards the sea. 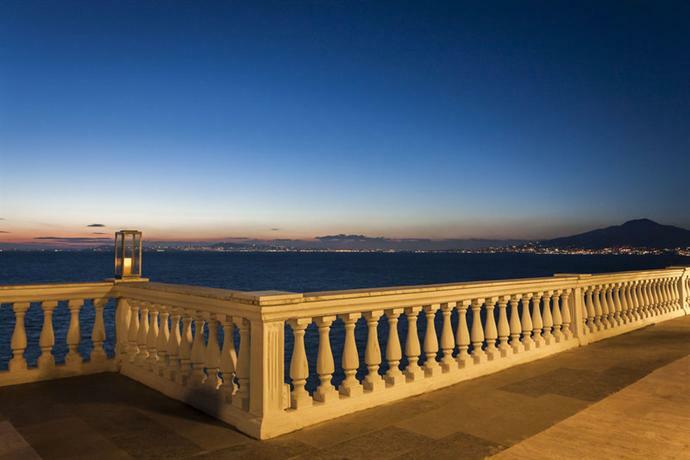 This luxury hotel offers a sweeping and grand view of the city and the bay, and has been designed and decorated in an Italian aesthetic sense. The hotel has been perched on the very edge of a cliff, such that you can dive right into the Mediterranean sea (but don’t). If you’d like to go exploring the city, you can easily walk over to the city center in 10 minutes and then find transportation to explore the rest of the city. However, if you’d like to stay in, there’s plenty of amenities available in the hotel so that you won’t get bored. 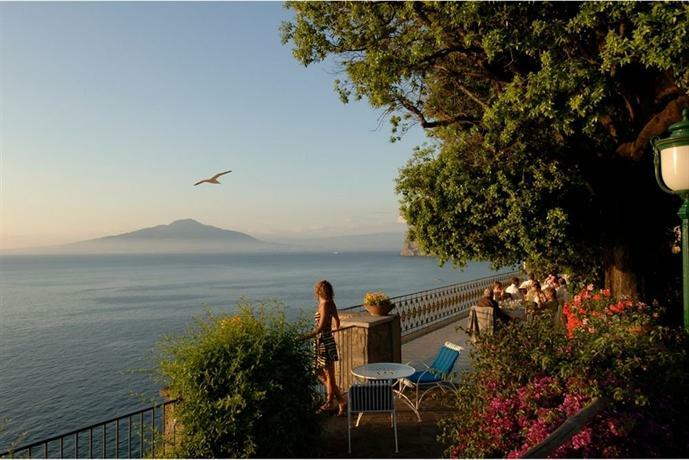 This hotel is also located on a hillside, with a view of the Bay of Naples, and Mount Vesuvius. A short ten minute walk can bring you to the center of the city or the trendy Piazza Tasso with its charming cafes and shopping stores. 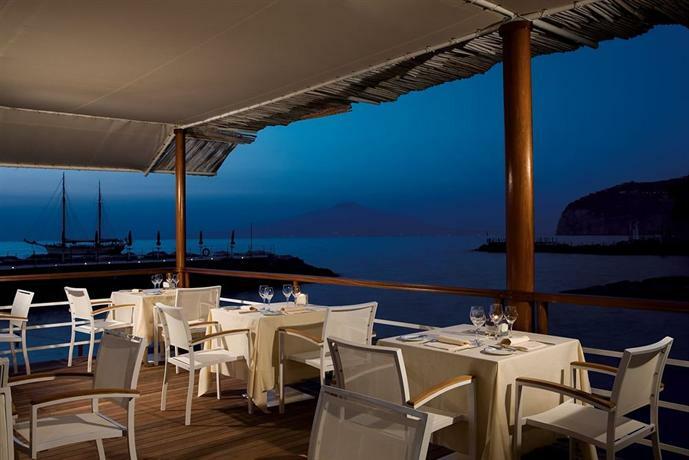 There are two in-house restaurants in the hotel — Le Ginestre and Le Querce — both of which offer a lovely view of the Bay of Naples. The swimming pool in the hotel is simply stunning, made of five interconnected swimming pools, and a whirlpool section as well. This boutique hotel is great for those who are on a budget and don’t want a hotel that’s too expensive. 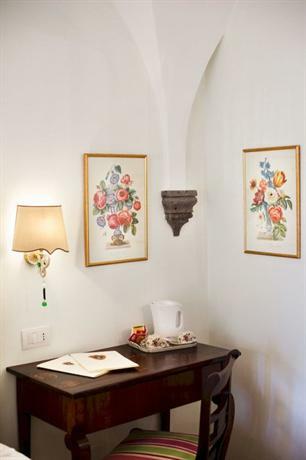 This palazzo is situated just across from the San Francesco cloister, a prime venue for picturesque weddings, and a short walk can also bring you to the lush green Villa Comunale garden. This building had been constructed way back in the 15th century, and signs of this heritage are very evident. The hotel also offers plenty of extravagances for a small boutique hotel — it features a lovely courtyard, a wine cellar, and even a restaurant and a cafe in case you want to dine in. 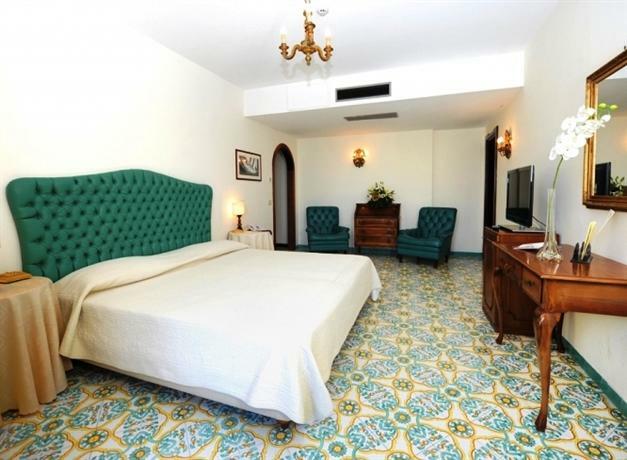 There are only seven rooms in the whole hotel, so it’s quite intimate, however all the rooms look simply charming with honey silk curtains, and tiled parquet floors.